FLEXIBILE NETWORK CONNECTIVITY: The DCPL5500DN has a built-in Ethernet interface which allows multiple users to connect within the network. ADVANCED SCANNING CAPABILITY: Supports multiple scan-to destinations such as E-mail, USB, SharePoint, Cloud Services, Network more(1). INNOVATIVE SECURITY FEATURES: Help protect against unauthorized device and document access, and securely connect to your network. 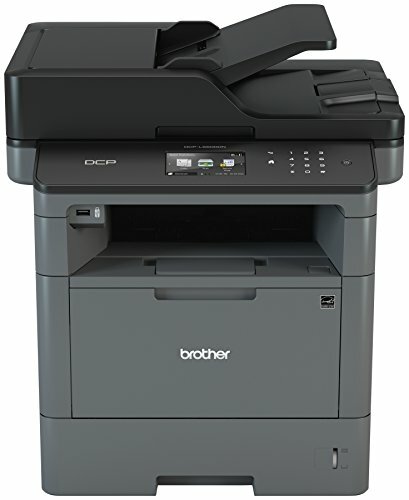 The DCP-L5500DN Multifunction Laser Printer enhances office productivity with a print and copy speed of up to 42ppm as well as various advanced features. This high-performance, multifunction copier produces professional reports, spreadsheets, correspondence, and other important business documents with exceptional graphics and crisp text. Additionally, a built-in automatic duplex printing function permits you to print on both sides of the paper, helping save money and resources. It also offers a 300-sheet paper capacity, expandable to 1,340 sheets with optional add-on trays (LT-6500 or LT-5500). 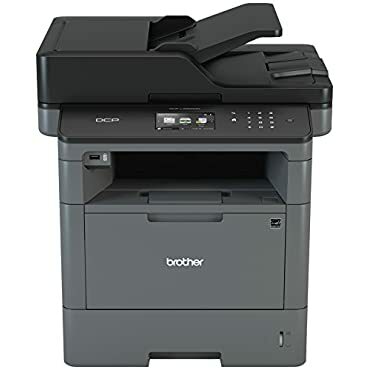 This office multipurpose printer, copier, and scanner offers Ethernet or wireless connectivity and mobile device printing and scanning is also possible via AirPrint, Brother iPrint&Scan, and other apps(1, 2). Quickly scan multi-page documents to a variety of destinations with the 70-page capacity auto document feeder. Designed with easy menu navigation and the option of creating up to 48 customized shortcuts for frequently used functions, the large 3.7-inch color touchscreen display built into the DCPL5500DN simplifies even the most complicated tasks. Users can also scan to and print from popular business cloud services directly from the touchscreen display without using a computer via Evernote, Google Drive, Dropbox, and more(1). This Brother monochrome laser multifunction printer offers advanced security features to keep your documents, network and devices secure. The DCP-L5500DN comes with a 1-year limited warranty and free at-your-side support for the life of your product, featuring online, phone, or live chat assistance. Store: The Game and Video Store Condition: Brand New Price: $499.99 Total Price: $499.99 Buy It from The Game and Video Store No returns. Awesometoner© Compatible 2 Pack TN880 Toner Cartridge For Brother DCP-L5500DN .. Here are all the current Coupon Codes we found for Awesometoner© Compatible 2 Pack TN880 Toner Cartridge For Brother DCP-L5500DN .. This coupon applies to orders of $100.00+.